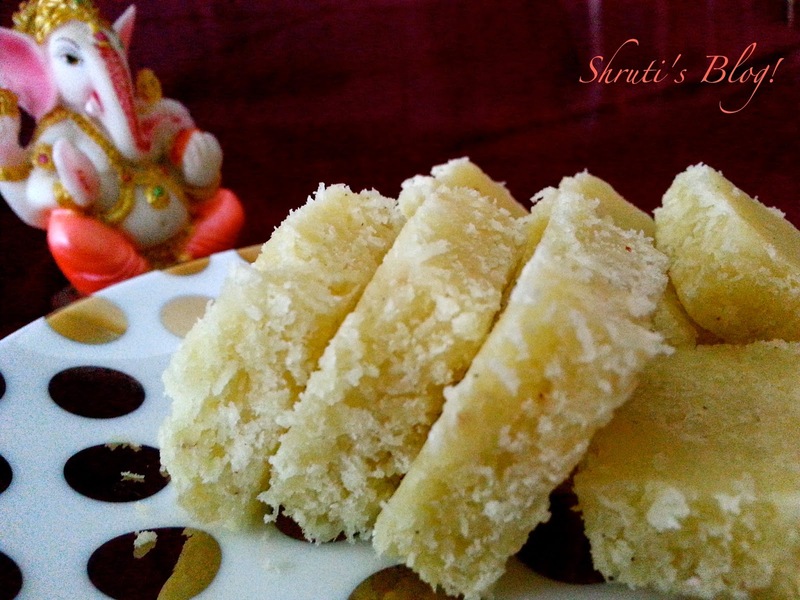 Shruti's Blog: Happy Birthday Dear Ganesha! Like every year, we gathered this year too at my brother’s to welcome Ganpati on Ganesh Chaturthi. This year was special as Aai is here with us in Melbourne. Lord Lambodar, the legendary foodie was treated to a sumptuous and delicious meal of steamed modaks, jalebis, gulab jamuns, pooris, tomato saar, matki cha bhat (moth beans pulao) pudina chutney, sundal, lagnatli batatayachi bhaji and patta pakoris made out of Commelina benghalensis, a succulent weed. True to her nature and nurture, Aai had ventured out in her son’s garden in Melbourne to discover an edible weed found in India as well, called Kena (Commelina benghalensis). Remind me to tell you about the weed and the pakoris made out of it. To come back to the Ganpati Pooja, with the naivedya offered, the family and friends gathered for the arati at the beautifully decorated altar where Ganpati was installed. Was it out of sheer force of habit, conditioned by the bonhomie of friends and family, the festive atmosphere and the enticing aroma of all the special foods? Or a result of the sense of familiarity we feel for the loveable deity? Was it improper of us to have made light of this? Probably not – come on, this is our Australian Ganpati - a very familiar, much loved bloke. He's very much a part of us, inside us, around us - by that token he's Australian. 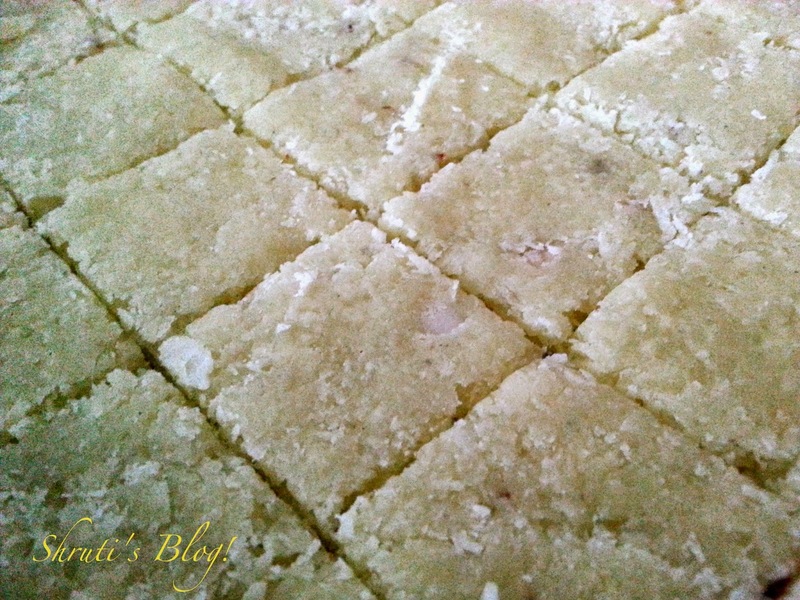 As Australian as the Australian Macadamia Coconut Burfi I had made for him earlier that day. Surely he has the slightly cheeky Aussie sense of humour as well. Macadamia nuts are indigenous to Australia. The meat has very high fat content, making the nuts very creamy and an ideal substitute for mawa or khoya. Grease a tray or thali in readiness for the burfi mixture. Pour the sugar in a wide, heavy bottomed pan and add just enough water to cover it. Switch on the heat and bring this mixture to a boil. Once it reaches a one-string consistency, add the grated coconut and powdered macadamia nuts and the coconut milk. Keep stirring the mixture continuously, scraping the bottom as well. When it starts to thicken add the cardamom and saffron. Keep stirring until the mixture begins to leave the sides of the pan. This is a crucial few minutes when you have to make a decision to stop or continue. Too much cooking and the mixture will become brittle in no time. The mixture needs to be thick, but moist. Look out for the sides of the pan, if they look encrusted and white with the candied sugar, remove the pan from heat and immediately pour the mass into the greased tray. Let me not scare you off - if you don't want to risk the utter crumbling of the burfi mixture by keeping it too long on the heat, you can remove it earlier. Then, you can add a few tablespoons of icing sugar or powdered sugar and mix well. The icing sugar or powdered sugar thickens the mixture and the mixing/stirring dries it to the desired consistency. 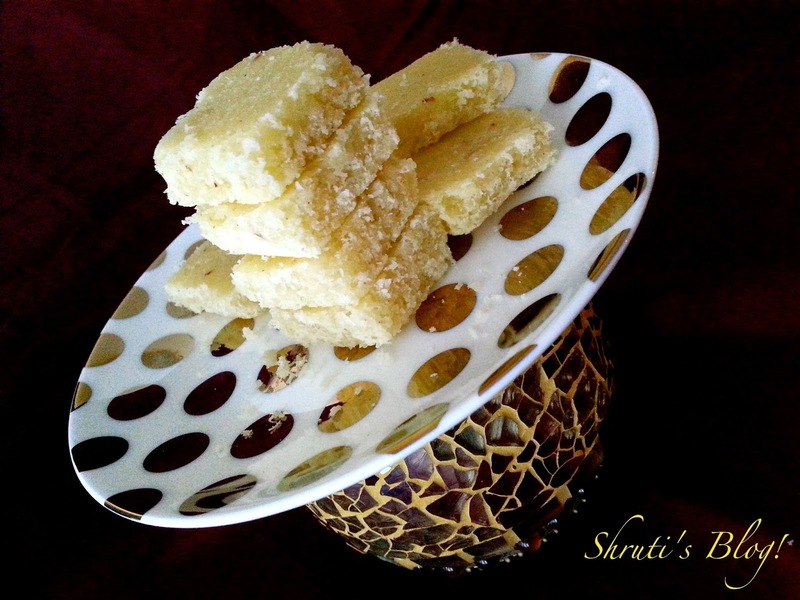 The only flip side of adding sugar in the end is the burfi may become a little extra sweet. Spread evenly and flatten quickly with a palette knife or spatula. Score square or diamond shapes into the patted mixture before it cools completely. Allow the mixture to set before cutting the burfis out.